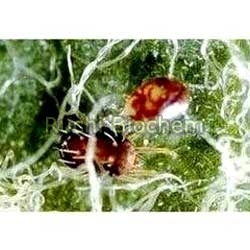 Spider is eco-friendly biological insecticide based on naturally occurring Verticillium Lecanii Verticillium Lecanii. When Spider is sprayed on insects, the insect gets pathogenised and killed. The spores of Verticillium Lecanii are slimy & get attached to the cuticle of the insects on contact. The fungus infects insects by producing hyphae from germinating spores that penetrate the insect's integument, the fungus then destroys the internal contents and the insect dies. Verticillium lecanii is known as a "white-halo" fungus because of the white mycelial growth on the edges of infected scale insects.